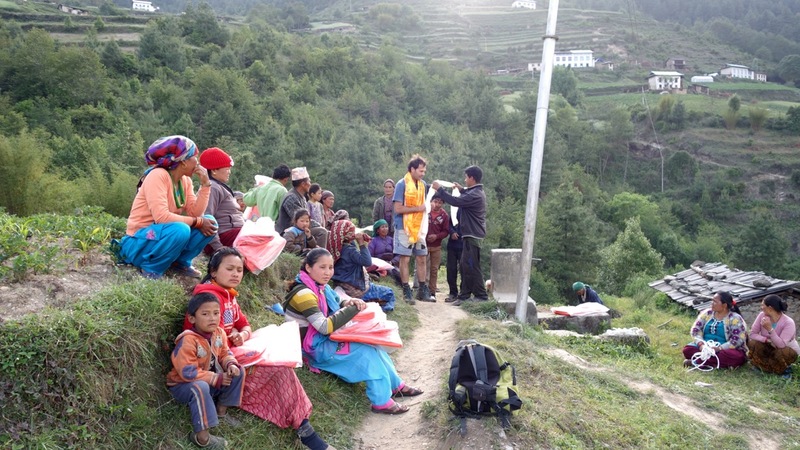 These were Soren‘s first words as he talked to me about his one week blitz visit to Lura and the villages of the Gyamdanda Community Forest, in the area below the Khumbu and Everest. Soren‘s first visuals of the earthquake in the plane approaching landing, were in his words, lots of landslides. Of the Kathmandu Valley, tarps everywhere, yellow, orange, blue. The brick factories’ tall chimneys in the outskirts, gone. Little evidence of damage on the drive from the airport to the Radisson ( Lazimpat).. and an eerie feeling as two thirds of the Kathmandu population left town for their villages of origin..
A different story in the areas North, West and North East of Kathmandu with, as we know, heart wrenching destruction and loss of life. In the Solu, little evidence of damage.. until one gets closer. Soren will be writing a report on his trip – he only just landed back home- and sharing more photos soon. With Lakpa, whose house suffered in the earthquake too, Soren went to look at all the houses, which are now numbered and damage recorded. More on that later. Right now, what stayed with me from Soren‘s description of his mission to Lura is as follows: everyone is scared. The earthquakes sounded like explosions, and each time there is a loud noise, everyone jumps. Earthquake damage was random, some houses destroyed, while others a few hundred meters away were not. People live outside, under tarps. Soren purchased and delivered 50+ tarps, which were distributed to those who needed help in the surrounding villages, and 418 corrugated iron sheets for temporary shelters. I was happy to hear that the villagers are interested in the concept of earthbag houses. I have been researching the subject extensively, and it seems a perfect solution for one storey buildings such as classrooms, animal shelters ( shall we build that jackal proof chicken house next trek?!) and , don’t laugh, toilets. Looking forward to reading Soren‘s words when he is ready, and thanking him, and all the people who supported the Lura Earthquake Fundraising! Please help us rebuild Lura! Footage from our last Well Being Well Doing Trek. The next one will be about rebuilding earthquake safe houses and school! ← Happy Everest Anniversary To Me, And To Us!